BOS produces two full scale musicals each year, in April and November. We rehearse two nights a week, January to April and September to November at Blackfriars Arts Centre. Membership is £25 for Adults and £15 for students/children, there is also a £15 show fee for each production. 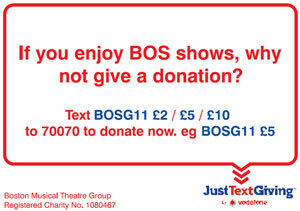 Please contact secretary@bosmusicaltheatregroup.org.uk for more information.